As newsprint devotees, the Weekly staff loves an opportunity to put practice out onto the page. For the Arts Issue, we asked South Side painters, sculptors, photographers, and graphic designers to submit one piece and an artist’s statement explaining what they do. Here are a few of our favorites. This photograph is a part of my “Isolated Building Studies,” a project that occupies the visual confluence of my interests in urban dynamism, socioeconomic inequality, and photography. 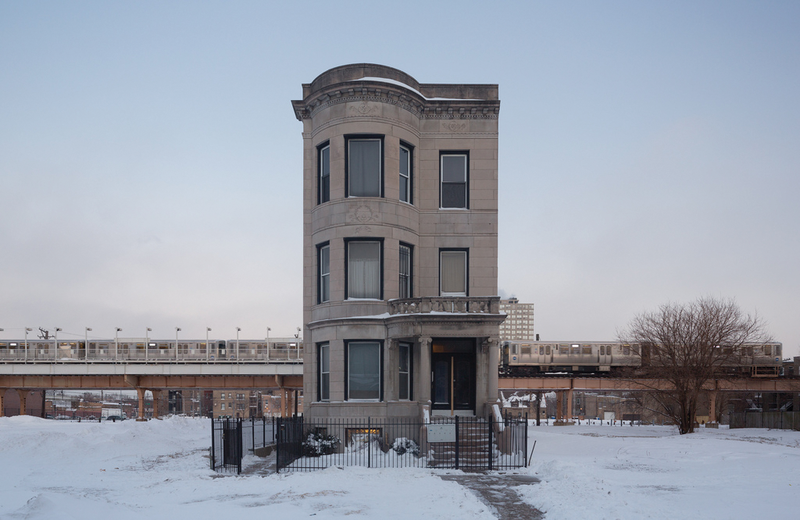 By using uniform composition in photographs of Chicago buildings with no neighboring structures, I hope to draw attention to new ways of seeing the common impact of divergent investment processes on urban communities. While the photographs are clearly trained on the buildings and their surroundings, one of the important aspects of the project has been to explore the buildings across time of day, time of year, and different kinds of weather. To that end, the image included on this page was made during the January polar vortex, when it was negative-fourteen degrees Fahrenheit. 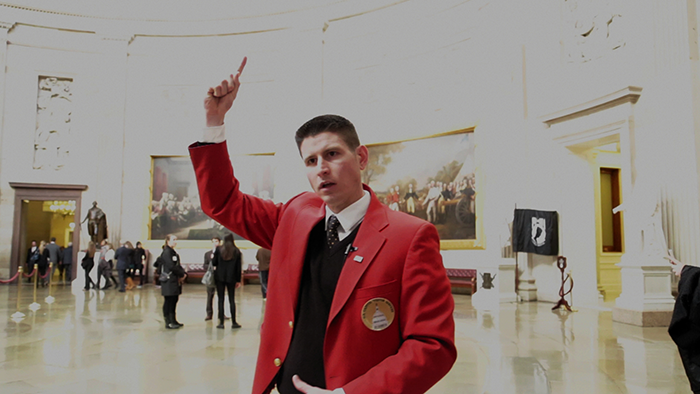 This image is a still from footage shot on a tour of the Capitol building in Washington, D.C. The man in the red jacket is our guide. He’s telling us where to look—we’re tourists in our own country. But you can’t see what he’s talking about. If you try, your eyes wander out of frame. He’s talking about the paintings in the room, the building, history. What if I told you that his name is Ryan, and that for him this job is about the money. He doesn’t make a lot, but it’s enough to support him, and it gives him time to develop as a performer. This job is about money but it’s also a way to develop. Any time you’re speaking in front of people it’s good practice. It keeps things limber, keeps things loose. Does he always point like that? Is this tour the same each time he leads it? I’ve only been on it once. Actually, I’ve never been on it. So have you ever seen that ceiling? Around the perimeter of the ceiling in the atrium there’s a fresco, painted over the course of more than fifty years by three different artists. The fresco chronicles important figures and events from the nation’s early history, eventually running back into itself. American history becomes a closed loop in this atrium, a series of old names and battles and bills chasing one another. Nothing new can happen. Humankind is living in parallel universes. Internal-external speculations and generalizations could never define such a beautiful reality that exists beyond the mundane surface. As broad a topic as it sounds, I’m using this metaphysical gateway in “Paradigm Shift” to present the cultural revolution that exists on the South Side of Chicago. As an abyss of ancestral and spiritual awakening, a powerhouse of wealth and artistic expression, the South Side makes me proud to reside in such a divine collective consciousness. The poetic, musical, jazzy, neo-soulish, Yoruba-fic, indigenous genius is almost unfathomable. 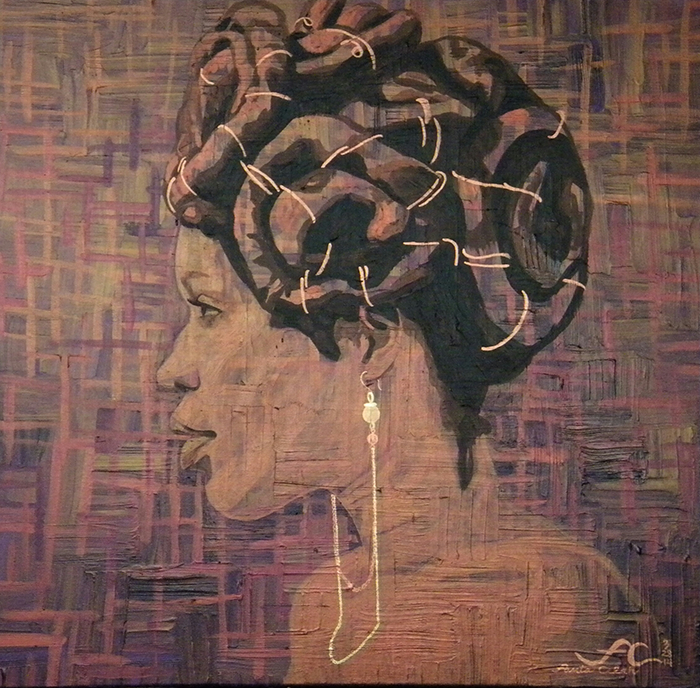 I am an artist and jewelry designer who has been featured on the Diva Show, the Tv3 Network in Ghana, and the Voxafrica Channel in the U.K. I’ve exhibited work in London, Dakar, Senegal, New York, Chicago, and have permanent installations in the African Union and the National Museum of Ethiopia in Addis Ababa. I’ve won a Black Excellence Award for my eco-mixed media collection, “Electric Soul.” I also recently recorded my first single in Ghana, “Traveling…,” which will be released this year. I’ve been working with the legendary Phil Cohran since 2008, and my music ranges from jazz to world, reggae, neo-soul, meditation/cosmic music, and historical time pieces. My painting can be described essentially as an abstract landscape, with no hint of human presence. In recent years, an ominous quality seems to be working its way into my paintings. If creating art is a personal search for meaning, one’s art cannot escape reflecting the spirit of the times. Our own historical period is characterized by ever greater pollution and exploitation of the natural environment—the air, water, and soil—resulting in the extinction of increasing numbers of plants and animals and a threat to the very future of our world. My imaginary landscapes seem to echo this anxiety about the destruction of the natural world. But along with the paintings, I also enjoy drawing what I observe in my environment, particularly garden and landscape subjects. 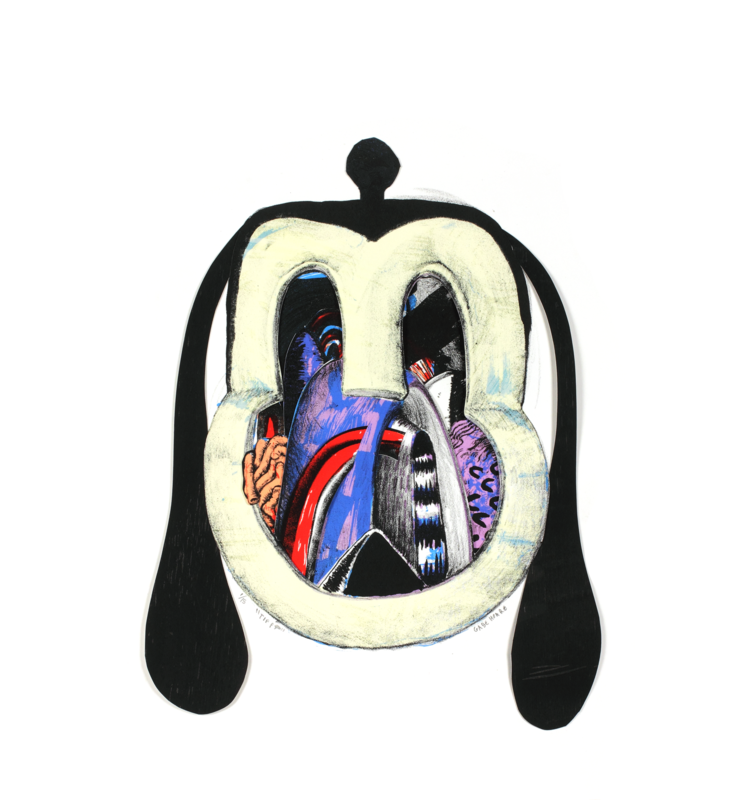 Some of these drawings are manipulated digitally to explore variations on the originals. So my artwork is a combination of lugubrious apocalyptic visions on the one hand, and realistic observations of nature on the other. I continue to attempt to resolve these two approaches and bring into my painting some of the elements of the drawings. George Zuniga is a professional artist with studio space at Project Onward, a nonprofit studio and gallery housed in the Bridgeport Art Center. 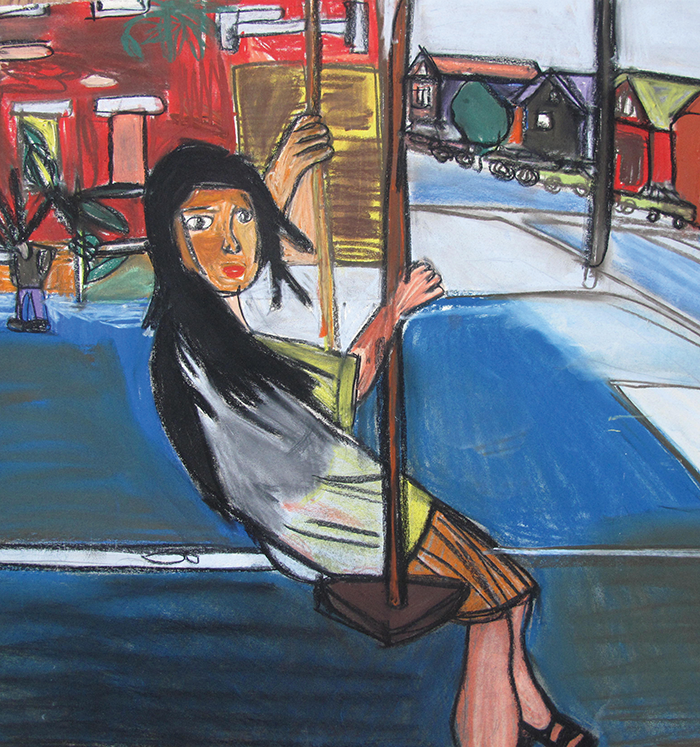 Project Onward supports the career development of adult artists with mental and developmental disabilities. George’s bold compositions and swift strokes, rendered in pastel, charcoal, and pencil, are examples of “artism,” a term George coined to describe the work of an artist with autism. A self-taught expert on Cold War­—era military armaments, television newscasters, Japanese animation, and heavy metal music, George is an obsessive collector of information, both visual and auditory. He is continually absorbing new material and finding inspiration in his constantly playing Sony Walkman cassette recorder. George is a prolific artist whose portraits are honest and vibrant; he has exhibited nationally and his work is in a number of public and private collections. George’s work is available now for sale at Project Onward and will be featured, along with the work of seventeen of his fellow artists, in the exhibition “Smile With Your Mind: Autobiographies of Autism,” on display April 4 through May 24. Gabe Hoare works primarily in sculptural installation and assemblage, transforming print-based works into interactive environments. He creates ritual objects that are both sacred and silly, affirming belief whilst simultaneously poking fun. After receiving his BFA from the University of Florida, Gabe went on to assist artists at Robert Blackburn Printmaking Workshop in New York City and Tandem Press in Madison, Wisconsin. He moved to the “Heart of Chicago” neighborhood in West Pilsen from his native Gainesville, Florida in 2010 to assist South Side artist John Himmelfarb. Hoare and print-partner Liz Born are the co-founders of Hoofprint Workshop, a gallery and printmaking studio housed in a former funeral parlor on South Oakley Avenue in West Pilsen. Hoofprint Workshop is a Chicago-based printmaking studio specializing in fine art editions; they employ processes such as relief, intaglio, plate lithography, monotype, and screenprinting. Hoare and Born work with artists established and emerging, students fine-tuning their craft, and clients who are looking to commission an illustration or have their own imagery reproduced by hand. The gallery at Hoofprint Workshop is committed to showing original work by artists who reside in Pilsen, Chicagoland, and throughout the Midwest. The dual printshop and exhibition space is dedicated to the display of a variety of work that includes—but is not limited to—hand-pulled prints (flat, sculptural, installation, and book-based) with an emphasis on analog and experimental processes.